Yankee Alpha Foxtrot Bravo: Blimey, It's Circular! A few hundred feet above Hayward (KHWD), immediately after departing VFR for Concord (KCCR) on an IFR (re)training flight, I look at the panel in front of me to check my altitude. We're in a Class D airspace (KHWD) under a Class C airspace (KOAK) which is itself under a Class B airspace (KSFO), and I need to keep below 1,500' for the next few miles to avoid blundering into the overlying airspaces. Par for the course, of course, if you fly out of Hayward, but when I look at the altimeter it looks so… weird. I point at it and blurt out something like "Blimey! It's circular!" to John who's in the right seat. John laughs. This is your brain on steam, I guess. All those circular electro-mechanical steam gauges in front of me — I remember them! — and it's even got an ADF! Mesmerizing, in its own sort of way. Quite a shock to this jaded G1000-spoiled techie, but what did I expect?! I'm in one of the club's C172's instead of the usual DA-40, and this is obviously going to be an exercise in old-school IFR flying. Flying the way it was when I got my instrument rating a decade ago. Some pilots get nostalgic for this sort of thing, but not me — I'm just a bit bemused and rather apprehensive. It's not just the old steam gauges — can I also cope with being under the hood again after all this time? Can I keep on top of the process and ahead of things on an approach? 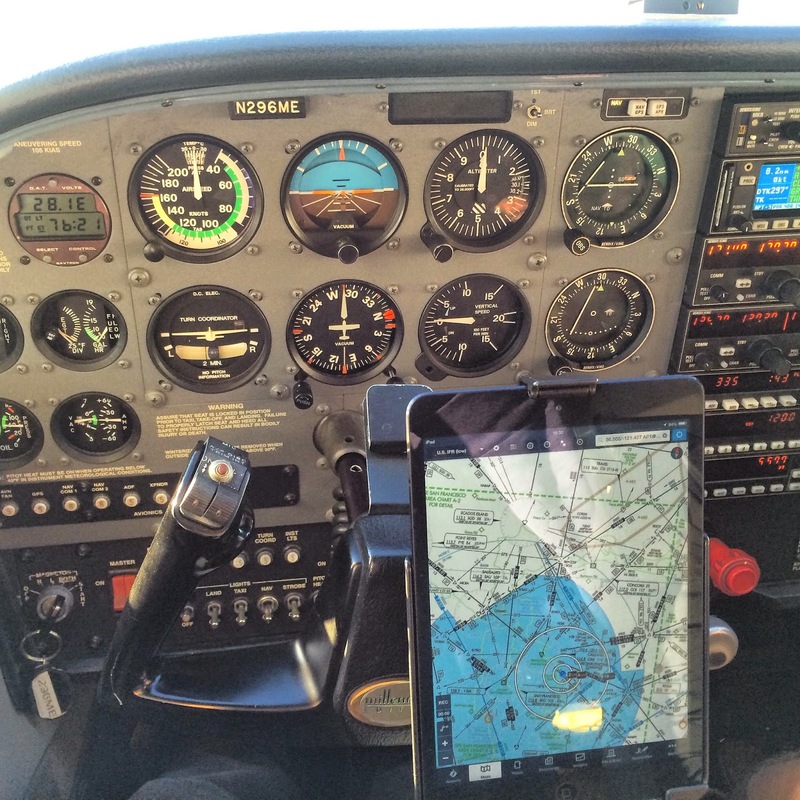 This wasn't really supposed to be about steam gauges or Cessna 172's — it was just supposed to be a way back into IFR flying for me. Which is why I'm flying with John today — to start the long process of getting IFR current and proficient again after a two+ year break from instrument flying. But the DA-40 and John weren't available at the same time for a while, and I thought it might actually be fun to fly the old 172 — and remember or relearn how to program the KLN 94 GPS or use an old-style heading indicator (HI) or an ADF. So I arranged things for today, and — as usual — set myself some easy targets. If I can get through the flight without upsetting the plane or making too many egregious mistakes, I'll feel confident enough to start working on the formal instrument proficiency check (IPC) that I need to get IFR current again. This is actually the first non-G1000 (i.e. non-glass) panel I've flown PIC in (I think) more than seven years. It's also the first time I've flown a C172 in more than two years, and the first attempt at IFR since around that time as well. At least I have Foreflight on my iPad with me as a safety blanket. And the panel's not quite as bare as the one I started with all those billions of years ago, even if it does still look a little, uh, Twentieth Century. Right from the start, this flight's just one damn thing after another, in so many unexpected ways. I'm not talking about the actual flying (more of which later), but about the broken nav light I find on pre-flight (meaning we have to be back earlier than I'd like), or the paper oil funnel that I lose in the cowl necessitating some deft work by John to retrieve it, or the way my headset starts a high-pitched screeching oscillation as we taxi to the runway (meaning I have to dig out a rarely-used second pair from my flight bag), or the total pilot-side audio system failure at the start of the LDA RWY 19R approach into Concord (basically meaning John has to handle the radios from that point on as I get plugged into the rear passenger intercom without PTT), or the ADF that doesn't actually work properly, or the … well, I'll stop there, because I'm making it sound like some sort of trial or annoying chore. It wasn't — this was actually a really enjoyable flight, and although I'll probably never fly this particular aircraft IFR (except maybe to get through a thin benign summer stratus layer back into Hayward or something), it's definitely fun to sit in the left seat of a 172 again and play old-time Real IFR pilot. Predictably, my instruments skills are rusty, my instrument flying rough. The first time around the practice LDA 19R into Concord (with full pilot nav) is an endless procession of missed cues and my looking blankly at the KLN 94 GPS wondering how the hell I should set it up for the procedure turn or the next leg, etc. And I'm not even under the Cone Of Stupidity for this first time around — and I'm using the autopilot, for at least some of the way (before I ditch it and hand-fly for the rest of the flight — much more satisfying). And when I do go under the hood, while my actual flying isn't terrible, it's hardly going to impress anyone. What does make me feel good, though, is just how quickly I internalize what the tiny attitude indicator (AI) and other instruments are telling me when I'm under the hood — I think that was my biggest worry, steam gauges or not, but it turns out it's not much of a problem at all. I feel gratifyingly comfortable mentally integrating all the needles, planes, and numbers the entire flight in ways that are simultaneously quite different from my way of working with the G1000 in detail but fundamentally the same with the big (mental) picture. Probably the thing that most flummoxes me during the flight is the inscrutable interface on the KLN 94 (an interface I once actually knew really well); I basically have to get John to prompt me every time I reprogram it or set it up for another approach. I have a few blank moments with the simple OBS as well — mostly, though, to do with how it relates to the KLN 94 rather than what it's telling me or how it works in general. So I start feeling good about things, despite the roughness and puzzled moments. I manage to blot my copybook, though, with one monumental blunder — on the start of the circle-to-32R maneuver at 700' I confuse Concord's runway 01L with the intended landing runway 32R, which is something I haven't done since my student days, I think. I'd probably have caught it fairly quickly and not caused some sort of international incident (I always check with the HI), but it was still a sobering thing to do. Thank god John caught the error early on and I could get away with a normal landing on the correct runway as though I knew what I was really doing. The landing (a touch and go) itself was also pretty rough — all that time away from the 172 is definitely showing. The second time around the LDA 19R approach — this time entirely under the hood and hand-flown — is smoother and better-executed, but still not precise or particularly inspiring; John still has to quietly prompt me here and there. And I'm definitely helped by having John have to do the radios for me; I'd probably be flying a lot worse without that help. And I've intermittently got the old death grip again on the yoke, something I thought I'd been cured of years ago. But as I tell John, at least I haven't killed anyone (yet), and it's definitely turning into a really enjoyable flight. We go missed again at Concord and head south for the ILS 28R into Oakland (KOAK), an approach I think I've said a million times that I could probably do in my sleep. But I'm actually wide awake right now, and I wonder how this one's going to turn out — it's one thing to be able to remember all the fixes and waypoints off the top of your head (and I can), it's another to be able to dredge up the muscle memories that let you make those small smooth adjustments on the way down the glideslope to keep you falling off the localiser. We shall see. As we're heading towards the ILS with NorCal Approach, John makes gentle fun of my accent and then admits he can't do an Australian accent to save himself. I taunt him with the observation that my first instructor Dave Montoya (RIP) could do a wicked good imitation of my accent, especially on-air, and that in any case, I don't really have an Australian accent any more — it's actually always been some sort of weird Anglo-Australian, and really never was truly Australian (I have three nationalities, and was born in in a country that really doesn't exist any more). John tries a few phrases, but he'll need a lot of coaching before he'll pass as an Aussie; I suspect it's easier for me to get IFR current and proficient again than John learning my accent. I'll do the funny accents on this flight if he'll do the radios, I guess. The ILS goes surprisingly well — John gets me to fly the AI so that the top of the AI plane's wings are just touching the bottom of the horizon bars, which works wonderfully — and I nail the approach, looking up at about 500' feeling pretty good at seeing the runway dead ahead. Woohoo! We go missed (well, you don't really go missed at Oakland, you just terminate the approach) and depart for Hayward, where I (finally!) land smoothly and gracefully. Mission accomplished, I think. So how serious am I about getting IFR-current and proficient again? Fairly serious, is probably the best answer — I definitely miss the challenges and fun of doing approaches, and the ability to get back in when the nearly omnipresent stratus layer comes in over Hayward or Oakland in the non-winter, but the cost of staying current can still be prohibitive. I'll probably book another instrument flight with John fairly soon, this time in the DA-40 (or some sort of G1000-equipped airplane), and if that also goes well, I'll try a full instrument proficiency check with him after that. We shall see, as I always say.